Why is it that French terms – at least applied to food and cooking – have more of a posh gloss than English ones? You don’t need to answer that, it’s just a rhetorical question. Boulangerie is so much more chic than plain ordinary Bakery (at least to this English speaker). Hence, the title of my post – to give a little more cachet to all that messy, floury, yeasty, sticky-doughy, crumby bread making activity in my kitchen over the past month – that is, when not occupied in the garden. The cookbook blogging club, The Cookbook Guru, is partly to blame the reason. 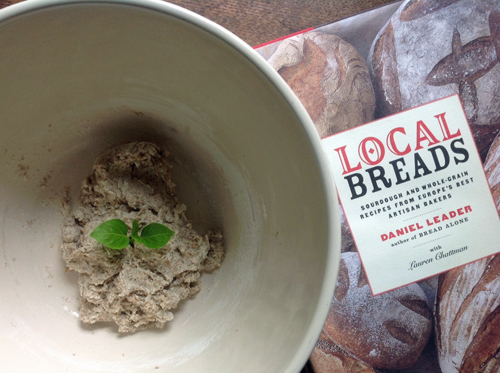 June’s book under review was English Bread and Yeast Cookery by Elizabeth David. Despite the title of the book, Elizabeth David managed to slip in French baked goods, like a bread version of petit pain au chocolat, in her very English book. More of that posh gloss? But, I also made a regional English “bread” or rather a yeasty griddle cake known as bockings in Elizabeth David’s book. 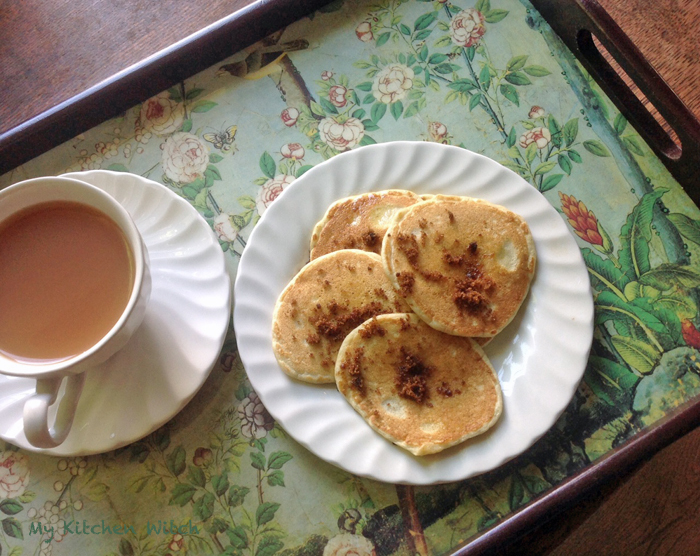 These are yeast leavened buckwheat pancakes very similar in texture to crumpets and traditionally served for afternoon tea, sprinkled with brown sugar. Summer has finally arrived here in Britain and it was time to make that sourdough starter. I’ve put it off too long, making do with dried yeast and a quicker preferment starter (only 10 hours versus 10 days to make!). Many, many years ago, I had made a sourdough starter when we lived in the US, but sadly, it had to be given a new home when we moved to Britain – those pesky customs regulations! And, when we lived in Oxford, given the presence of several good bakeries in town, it never occurred to me. Finally, in northern England, I knew it was time. I created a levain starter described by Daniel Leader, but added a Greek twist. Based on Greek folk custom, a sprig of basil that has been blessed in church is often inserted with the starter – perhaps superstition, but possibly part logic. Since I had a blessed sprig of basil, I thought I’d give it a go. It worked – as I explained in my post, The Basil Effect. And, I settled on a perfect method of baking that sourdough. Ever since Celia@Fig Jam & Lime Cordial posted her experiments on baking bread with her cast iron casserole and her Römertopf, I’ve been baking this way quite regularly – with a little steamy adjustment of my own by spraying with water before putting the lid on. I do like a nice crisp crust and a chewy texture. Plus, Celia’s cold pot/cold oven solution is an improvement over that technique that became popular a while back, preheating the pot, gingerly manhandling it out, plopping the dough in, and wrestling it back into the oven, all the while trying not to get burnt. (Blisters are neither pretty nor painless!) It’s put my oval Le Cruset pot back in action after languishing in the cupboard. It had been superseded by a round one that was better suited to fit the stove-top hob. But, the oval shape is perfect for a loaf of bread. 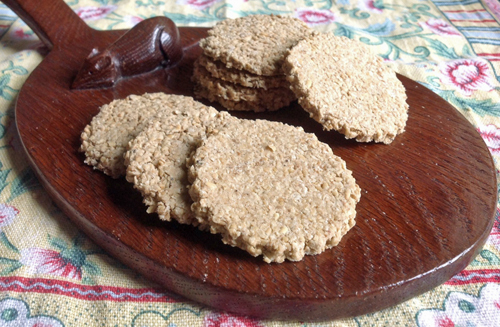 I find my cooking/baking more and more inspired by other bloggers … hence these Scottish oatcakes posted by Sandra@Please Pass the Recipe. As an experiment, I modified her recipe somewhat, using oat flour and pinhead oats in place of her rolled oats. Although I had to compensate for the less absorbent pinhead oats by adding more flour, they turned out well – very moreish. However, I will probably return to Sandra’s more accessible recipe with rolled oats next time I make these. And, there will be another time if my husband has anything to say in the matter! Then there was my variation of thyme and seed pīde that Selma@Selma’s Table posted a little while ago. 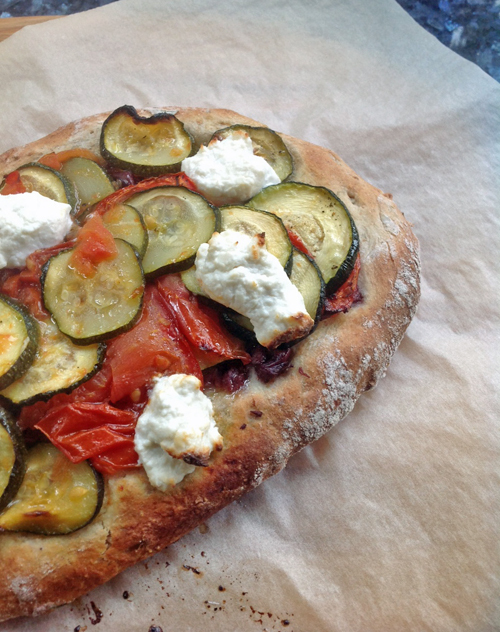 My version was topped with a smear of tapanade, roasted courgettes and tomatoes, and goat’s cheese. The family voted these a definite thumbs up, so it is now going onto the list of our regular supper repertoire. Although, I really must try it with Selma’s leek topping next time. And, just because I happened to have the correct amount of leftover cold cooked new potatoes, I made krumkaker’s sourdough loaf with potato. 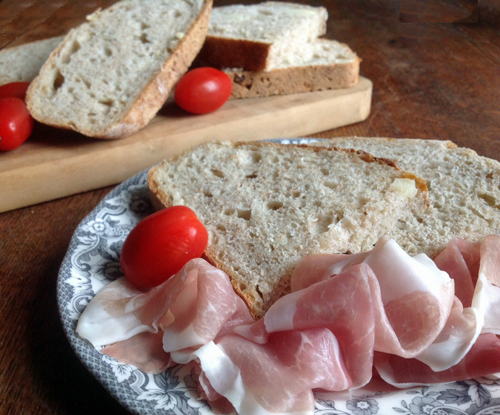 With thin slices of prosciutto, this bread studded with pieces of potato gave new meaning to “meat n’ potatoes”. 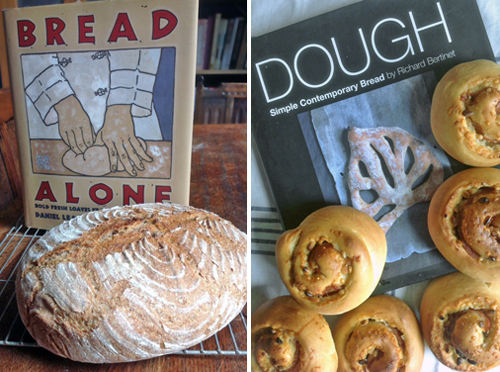 To top it all, I seemed to have acquired two new bread books this past month – Daniel Leader’s first book, Bread Alone and Richard Bertinet’s Dough. Between the Leader’s rye sourdough starter used to make a Danish light rye bread and Bertinet’s Parmesan & Parma ham rolls, I’ve made a good start in using both of these books. With all that bread (and crackers), it is a good thing I finally succeeded in making a credible feta (see my post, Rennet Experiments, for more of that saga). 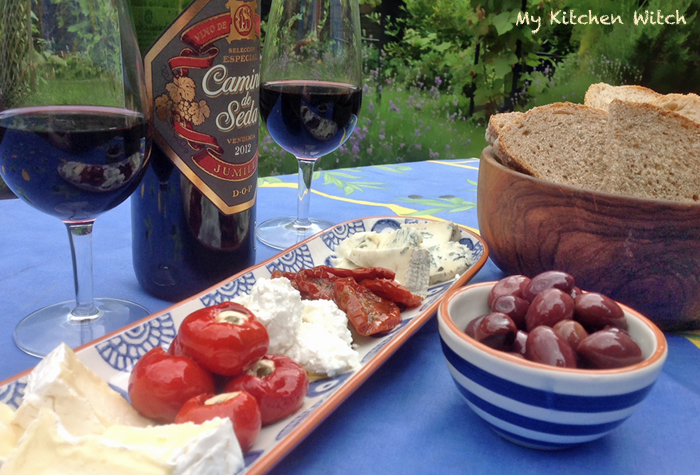 Time to kick back in the garden with two of life’s little pleasures: bread and cheese… I mean, three of life’s little pleasures: bread, cheese and a glass of wine. A monthly IMK (In My Kitchen) post. Check out the fabulous Celia @ Fig Jam and Lime Cordial who lists all of us IMK bloggers, writing about what’s been happening in our kitchens each month. A chronological listing of my In My Kitchen blog posts can be found on a separate page, just click the link or look under the heading of Diaries in the Menu bar above. If you’re boulangerie (even sounds better on the tongue than bakery which is important when we’re talking food) was closer to my home I’d be over there in a flash for a glass of red wine and some nibbles with that beautiful homemade bread. Great post! If only! You would be welcome anytime. Now that I have two sourdough starters, it is a foregone conclusion that I will be baking bread regularly. But, when the weather is good here, I have to get out of the kitchen…out of the house. It never lasts before rain comes again. The trials and tribulations of a British summer! These all look delicious but I will start tomorrow with the oat cakes. I was planning to make some anyway for the houseguest I’m expecting, so this recipe is just what I needed. You will love Sandra’s recipe – she makes it easy to do. These went down very well with my boys who are oatcake connoisseurs. I like the monthly roundup idea for your IMK posts, I might pinch it! Thanks for the mention re the oatcakes. I find bread baking satisfying too, it not called the staff of life for nothing. I agree that food and cooking terms sound far more exciting in French, in Italian too, it’s the passion.. The roundup works for me. I get ideas and inspiration from all sorts of posts. The oatcakes were good and I did say I would experiment with pinhead oats. However, your rolled oat version, I believe is a better one – less crumbly, and less flour used. And, now I have two sourdough starters, I seem to be set for bread making. 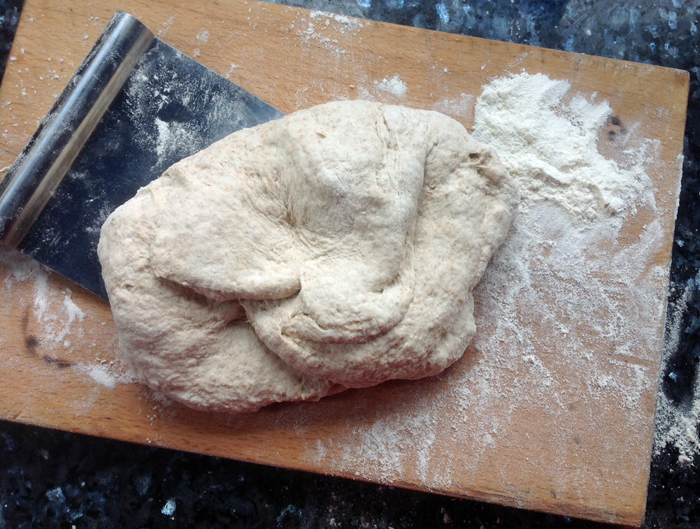 Have you tried Richard Bertinet’s very different method of kneading? It’s messier on the hands, but uses less flour and allows for more air bubbles to form. I like that cooking terms should be passionate, so I will continue to pinch from French and Italian! I’m not familiar with the Bertinet method. I find spelt likes to be kneaded only a small amount, but I do 3 stretch, fold and tuck routines. I’m still not entirely happy with my bread, maybe I should investigate…. I am so glad the technique worked for you. I think there is less handling of the dough and more about keeping air pockets and allowing dough to stay moist. However, it is sticky and a disaster if I forget to remove my rings before I get my hands in! Great post – my mouth is watering! We both know how important bread is on the Greek table! And, baking it is such fun. What a gorgeous array of boulangerie masterpieces! So glad the potato bread worked for you. I am definitely trying the cold pot/cold oven combination this weekend. Thanks for the inspiration! You are welcome! Praise, indeed, from a master baker! The potato bread was so good that my husband nearly scoffed the lot. I’ve been meaning to try Celia’s clay pot baking version that she lists as one of her experiments. Let us know how your bread baking experiments go. A wonderful roundup of your yeasty activities, especially since I missed quite a few along the way. Although I am still lolling about in Asia, one of the things I miss is a good home made Pizza. Yours looks very summery with tapenade and zucchini. And as wine is scarce and expensive here in Bali, I am lusting for a galss or three. I have this delicious image of Lolling in Bali! What a great title for a book. The tomato/zucchini/tapenade pide was really delicious. The crust was studded with sunflower seeds and I substituted fresh rosemary for Selma’s thyme in the recipe. I wish I could teleport a glass of wine (or three) to you! But, it will be all the more appreciated when you get home. this is all looks lovely I must give oatcakes a try.! Sandra’s oatcakes are really tasty and easy to do. The recipe yields about 3 dozen, but the were gone in a flash in this house! Debi, your breads are beautiful! I’m imagining the aromas in your boulangerie kitchen… aaaahhhh. I also love your version of ‘meat & potatoes’ — and the appealing prospect of wine, cheese, olives, and BREAD! The oven got a real workout! For once I was grateful that British summers can sometimes be cool. The potato bread had a wonderful flavour to it. I was particularly keen to try it since there is a tradition of potato bread from Pennsylvania where I grew up and I remember it fondly. I have to use the past tense and say that it WAS all tasty! toys … tous… what’s in a word? Naughty spell check. 😉 Merci for the lovely compliment! It was such a coincidence that I had been given a cutting of a blessed basil by a like-minded friend who had just returned from Greece. I just had to test the folk custom. I must say that your bread baking activity inspires me. You are such an intrepid baker! Amazing how we inspire one another! I love how our IMK posts allow us peeks into various kitchens once a month. Hope your sourdough works out! I love the shape of my oval Le Creuset, but it really does not fit well on the circular hob. I was so glad when I thought to use it to bake bread. Check out Celia’s experiments and the results. I settled on the cold pot/cold oven technique as this is suited to my oven that heats quickly on the fan setting and tends to be on the hot side. I think you have to find a technique that suits your own oven as I have learned ovens all operate in individual ways. What a great post. So many yummy things in your kitchen. I can imagine how your boulangerie smells – divine. Thanks very much! You are right, nothing beats the aroma of freshly baking bread! G’day! +etit pain au chocolat is my absolute favorite! Really enjoyed your post and thanks for this month’s kitchen view also! Thanks Joanne! The Petit Pain au Chocolate were delicious. They were gone within a few minutes of taking them out of the oven. Debi, your baking looks fabulous. I especially like the look of your bread in the Le Creuset. pot. Did you put it in a cold pot in a cold oven? I also intend to make Sandra’s oat cakes. I did, indeed, put the dough in a cold pot and then place it in a cold oven before turning it on. My oven (a British Falcon – part of the AGA Rangemaster group) heats very quickly on the fan setting and is a little on the hot side, so this particular method of Celia’s works very well for me. I suspect that each individual needs to experiment as ovens may be different. You will love the oatcakes. They certainly went down well with the Scots oatcake connoisseurs in the family. 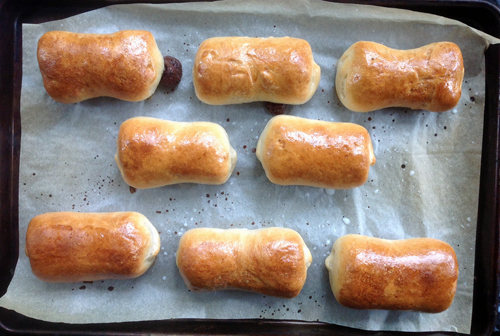 I meant to comment ages ago, Debi – wonderful boulangerie post! 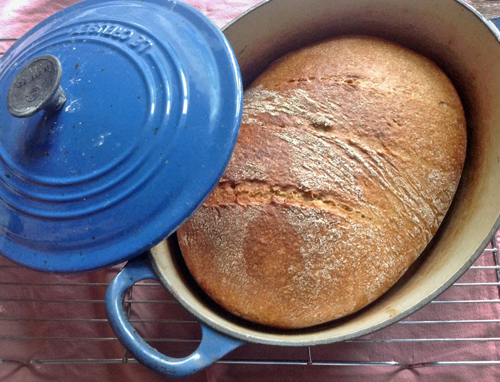 That bread in the oval LC pot looks fabulous – I have one too and use it mainly in the oven for braising and pot roasting as it doesn’t sit well on the hob. Love oat crackers so will try Sandra’s recipe and your pain au chocolat look utterly adorable and terribly moreish. So pleased that you tried my pide – your toppings look insanely delicious! Slma, your pide dough sounded so good that I just had to try it (and it was superb!). However, when I looked in the refrigerator, there were no leeks! Also, tamarind paste isn’t something I normally stock. So, I asked myself what else would do. The roasted courgettes and tomatoes were perfect and to add a further Mediterranean touch, salty tapenade went very well with the nutty and slightly sweet pide. The LC pot is perfect for Celia’s method of bread baking and I am so glad It has become useful again. Do try Sandra’s oatcakes. They are definitely moreish! Thanks for dropping by my kitchen this month. Now that I have two different sourdough starters (and another one in the making), there is no stopping me making and experimenting with breads. I’m finding it very rewarding. I love baking bread. Thanks for stopping by my kitchen! Can I shop at your boulangerie? Pain au choc’s are my favourite. I am new to what’s in your kitchen so my post is a little late. It is up now if you would like to read it. Take care. Emma. The pain au chocolate were different from the stuff you get in a regular bakery – no flaky pastry, but a bread coating. Elizabeth David says in her 1977 edition book that this type are old-fashioned and almost unheard of outside of France. Am going over to have a look at your kitchen – better late than not posting at all! Love my sourdough bread. I’m so glad I took the leap and made the starter.